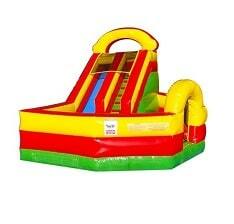 Bounce,Climb and Slide - in FUN size!! This slide is perfect for the little ones! Riders bounce in the bounce zone, then scale the climbing wall before sliding down the thrilling mini-slide. The bright and colorful red-yellow-green scheme fits nicely into any decor. Capacity:: Up to 5 participants, up to 75lbs per person. Max 375lbs. Minimum space: 18L x 16W x 15H.